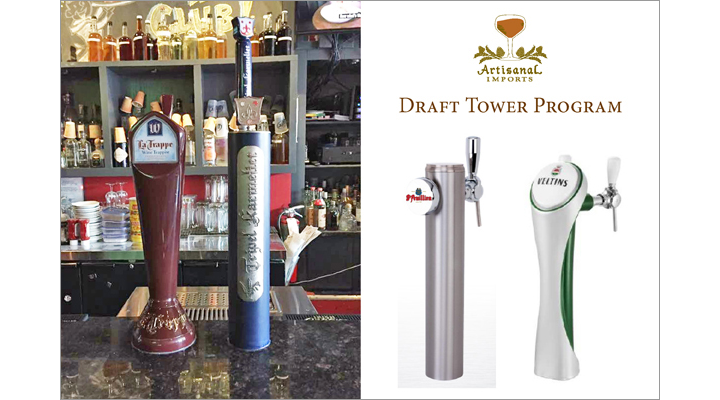 Choosing the right beers to put on tap is part art and part science, requiring knowledge of beer, your business, and the customers you are serving. A large element of a successful draft selection is consistency. Consistency builds trust and brand loyalty. Return customers which seek out a specific brand will drive sales, and will ultimately act as guerilla marketers themselves. Proving your establishment can reliably sell a brand will translate to better relationships with accounts, and ideally, higher priority and lower prices. First off, consistency doesn’t just apply to keeping a beer on tap. Is the beer you are considering consistent in quality? If you answered no to this question, cross it off your list. Is it guaranteed to be in supply? Year-round or seasonal? Is the account manager reliable? The more trust you can place in a product and its suppliers, the better off your business will be. So, how do you know what to choose? The number of taps you have will be a large determining factor. If you’re working with three or less, you can’t really afford to try something on a whim. After all, while experimentation is integral to honing an ideal lineup, it is by definition inconsistent. In this case, it would make more sense to experiment with bottled or canned beers. If one brand or style is hopping off the shelves, then you can begin investigating a possible draft account. On the other hand, if you’ve gone the beer-haven route, and offer 10 or more draft selections, it’s in your interest to leave one or two open to rotation. Be careful, though: rotating more than twenty percent of your variety regularly could be a recipe for disaster. Remember, the ultimate goal is to have reliable sellers, and to quickly find what they will be. If you don’t know what will sell or what might mesh with your business, start with what’s tried and true, and find brands that align with your own. For an establishment hoping to separate itself from the herd of watered-down watering holes, brands with history are a great place to start. A brand with a century or more of success at its back is one you can tap confidently, knowing it will complement a variety of palates, dishes and environments. Imports in this case, are a reliable choice, as they have built their reputations on balance and subtlety which won’t leave a drinker sputtering, and also lend an added degree of distinction to your establishment, and the drinker themselves. If you’ve got four taps to work with, offer a consistent variety. Rather than three American IPAs and a barrel-aged quad, paint a smooth curve of choices. For example, choose one IPA, one Wheat Beer, one Amber Ale, and one darker beer like Porter or Stout. If one doesn’t sell well, choose a different brand within the same stylistic realm. Make sure they’ve got a proven track record. Listen to customers and adjust accordingly. They will always be your best feedback. If they’re asking for a specific beer, they’ve identified with it and are willing to purchase it. If they’ve purchased it, that’s a vote of confidence. Tracking these sales and logging feedback is crucial. You can’t just go with your gut, or switch out a long-running tap because you tried something you liked better. Doing so jeopardizes your customer base. Repeated disappointments translate directly to lost customers. Think of successful draft accounts as inertia, and do your best to maintain it. If sales are telling you to cut out wheat beers and add an IPA, do so, and make sure it brings something unique to the table. Perhaps one IPA offers a lower ABV, or more body. Consistent decision-making processes in draft selection helps the customer know what to expect, and increase chances of a sale. For example, you may choose by style as mentioned above, or offer more seasonal choices, or rotate your selection based on your menu. Drastic jumps in what you offer will alienate and confuse your customer. Make sure they know where you’re coming from, selection-wise. Consistently good choices will build trust, which will increase your ability to add new, more experimental offerings over time. Another important question to ask yourself is whether your draft selection is consistent with the environment, season, and clientele. A draft menu in Texas is going to look different from a Rocky Mountain ski resort’s menu. And that same Texas bar’s menu will vary according to the season. Summer will require consistently refreshing offerings. Winter may call for a more uniformly warming and hearty variety. What other sort of outside variables are there to consider? Are you located right next to a major concert or sporting venue? You might want a consistently easy-drinking selection. How do people reach your establishment? If people can only drive there, you want beers that are consistent with being able to drive home! In summary, draft selection isn’t a gut-feeling kind of game. You’re gauging reliability, because consistency equals sales inertia. Consider the supplier’s reliability and history, the reliability of the product, and make sure it’s consistent with your business and values. Above all, listen to your customers.